Little technical information here from me, but hopefully some of us may find this interesting/diverting. I had the great pleasure of meeting and shooting with Mike Oria over the last day during a business trip to San Fran (and what an absolute pleasure/privilege that was). 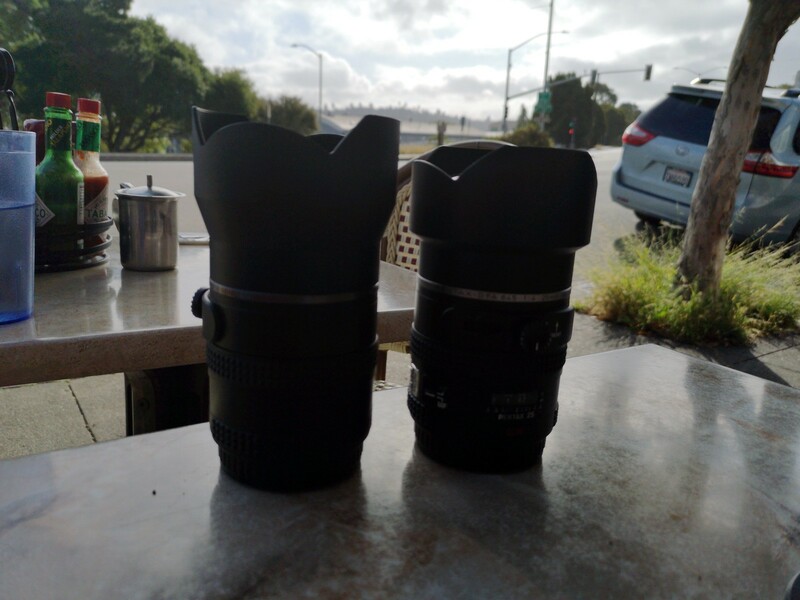 During the trip, our respective 25mm lenses also met one another! Since Mike's is the DFA and mine the DA, shots of their tête-à-tête provide interesting comparisons. We also looked through the lenses from both ends in search of evidence of internal differences such as baffles, masking, etc. (not a very scientific way of doing this, admittedly) and could see none to the naked eye. 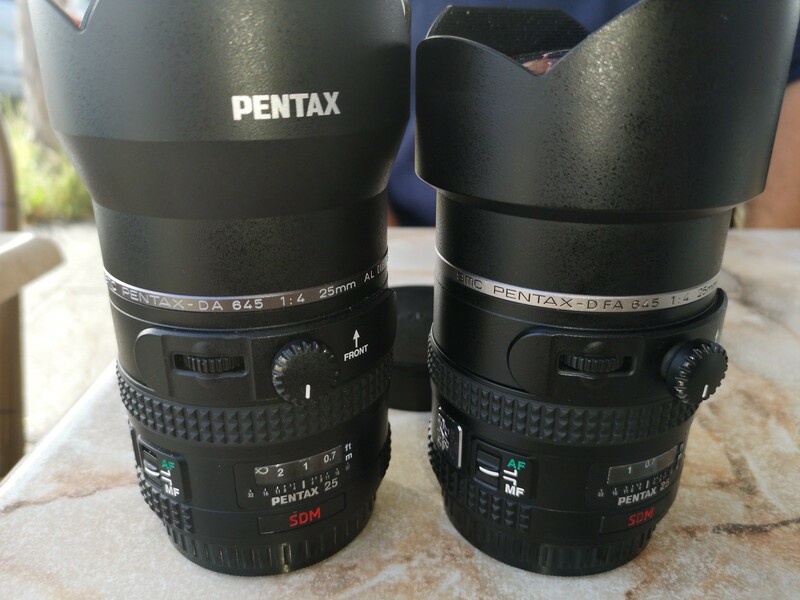 Most sources say the only difference between these versions is the hood size (and associated differences in the lens housing). 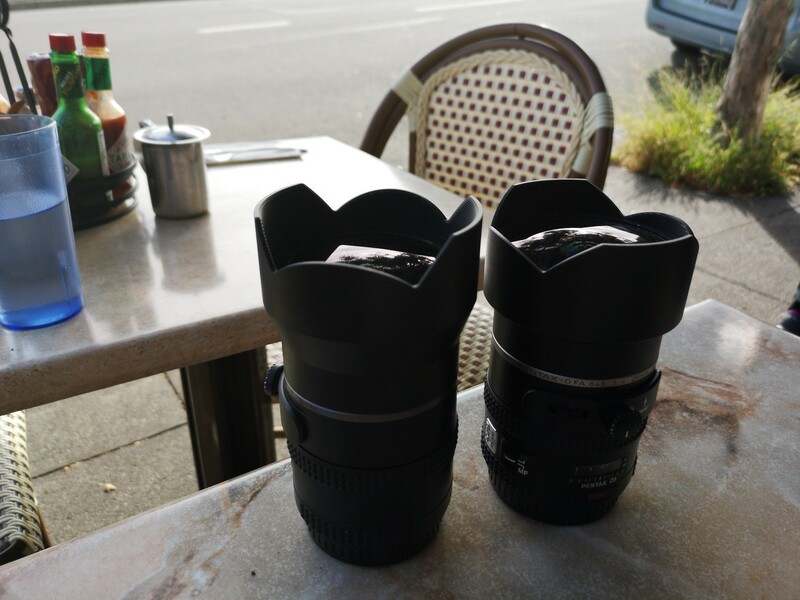 Notice the glass at the front of the lens differs too. Some people claim there are also internal differences involving baffles, etc. affecting the useful image circle - but I have not seen any authoritative sources for this; nothing here settles that question. It would be amazing you both did the same photo just for comparison. I guess that would be the ultimate test to find differences. If you shoot a picture looking down into each lens with some off-axis light source, you can use the spacing and sizes of the tiny reflections of that light source to gauge the internal element and group structure. Differences in the number, size, and spacing of those reflections tells you something of the differences in the number of glass-air surfaces and differences in their curvature. Any color differences in the reflections tell you about differences in their coatings. Very interesting to see this. It's a little hard to see in the picture, but is that a plastic ring around the outside of the front element? 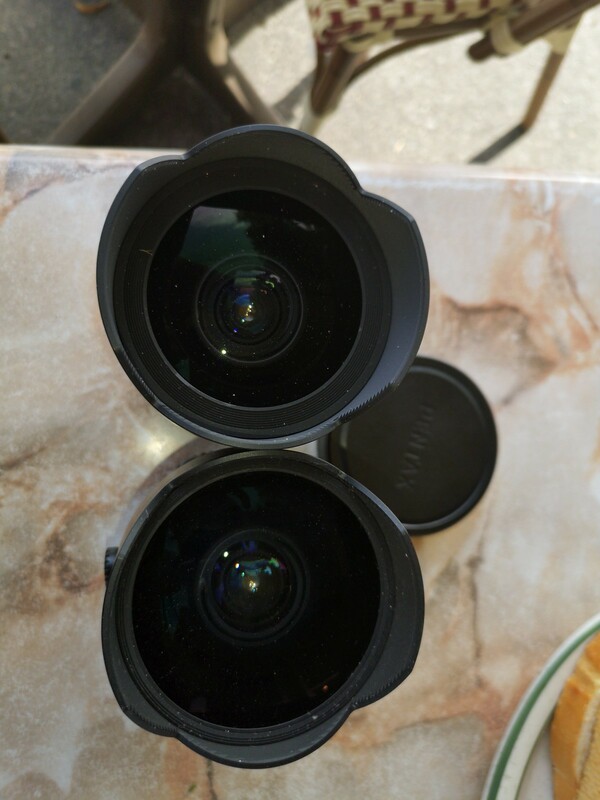 If not then they must have trimmed it down, which would make sense given that this was a QC issue with the D FA lens. Next time I am in San Fran (which I expect to be reasonably soon), we plan to. Using the same body as well, to avoid that being a factor. Such a thing may require more precision and time-input than will be practicable, but you never know! First, Ed, thanks for the very enjoyable hangout! What began as an evening shoot at the Golden Gate Bridge pretty much ran until breakfast in Sausalito the next morning. Ed is very serious about his photography and to watch him work is inspiring. Next, geez, if i knew we'd be taking pictures of our 25's to post, I'd have wiped down all the dust- that lens hasn't been cleaned in at least 10 outings. lol! We did agree to shoot some more clinical comparative images included, as Ed explained, mounted to a single camera. We could even get Tim (aka blackcloudbrew) involved to bring over a FF 645 body to look for any other differences that may be revealed, besides the expected vignetting of the long hood. 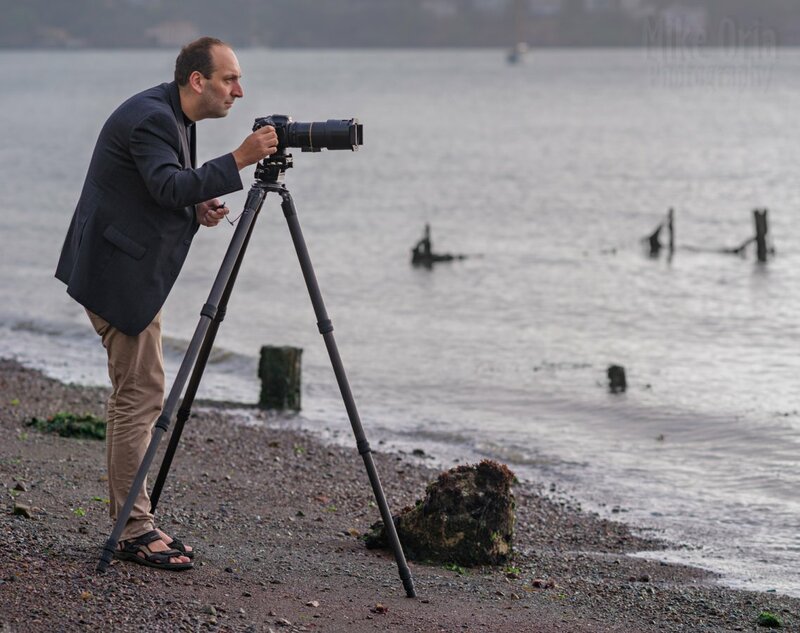 Lastly, I grabbed a shot of Ed in action on the beach in Sausalito...just look at that intensity! A rarely seen internal look at the DA 25mm (a cross section). Last edited by desertscape; 12-16-2018 at 12:09 PM. If either of you has access to a film body, you could ascertain the different in image circle, assuming the later one (at least) is optimized for 44x33 and vignettes on 56x42. What I always do is to put a piece of white paper (instead of the camera body) behind the lens and project a bright scene onto the paper. This way, you can immediately see which lens has a larger illumination area.